New York City, officially named the City of New York, is the most populous city in the United States, and the most densely populated major city in North America. The city is at the center of international finance, politics, entertainment, and culture, and is one of the world's major global cities (along with London, Tokyo and Paris) with a virtually unrivaled collection of museums, galleries, performance venues, media outlets, international corporations, and stock exchanges. The city is also home to the United Nations, along with all of the international missions associated with it. Located in the state of New York, New York City has a population of over 8 million within an area of 309 square miles (800 km²). It is at the heart of the New York Metropolitan Area, which is one of the largest urban conglomerations in the world with a population of over 22 million. New York City proper comprises five boroughs: Brooklyn, the Bronx, Manhattan, Queens, and Staten Island, with all but the last having populations exceeding one million. The city includes large populations of immigrants from over 180 countries who help make it one of the most cosmopolitan places on earth. Many people from all over the United States are also attracted to New York City for its culture, energy, and diversity, and by their own hope of making it big in the "Big Apple." The city serves as an enormous engine for the global economy, with an estimated gross metropolitan product of $1.28 trillion in 2010, and is home to more Fortune 500 companies than any other place in the United States. Long before the arrival of European settlers, the New York City area was inhabited by the Lenape people, including such tribes as the Manahattoes, Canarsies, and Raritan; Lenape in canoes met Giovanni da Verrazzano, the first European explorer to enter New York Harbor, in 1524. Following the 1609 voyage of Henry Hudson, European settlement began with the founding of the Dutch fur trading settlement in Lower Manhattan in 1613, later called New Amsterdam (Nieuw Amsterdam) in the southern tip of Manhattan in 1624. In 1626, Peter Minuit purchased Manhattan Island and Staten Island from Algonquin tribesmen in exchange for trade goods. Minuit's settlement was a haven for Huguenots seeking religious freedom. New York has ever since been a haven for immigrants seeking freedom from oppression. In 1664, English ships captured the city without struggle, and the Dutch formally ceded it to the English in the Treaty of Breda at the conclusion of the Second Anglo-Dutch War in 1667. The city was renamed New York, after James, Duke of York, and became a royal colony in 1685 when James succeeded his brother as King of England. New York was greatly damaged by fire during the Battle of Brooklyn at the start of the American Revolutionary War, and was occupied by the British until November 25, 1783. On this date, marked annually thereafter as "Evacuation Day," George Washington returned to the city and the last British forces left the United States. The Continental Congress met in New York City under the Articles of Confederation. On September 13, 1788, the United States Constitutional Convention temporarily set New York City as the first capital of the U.S., and on April 30, 1789, the first President of the United States, George Washington, was inaugurated at Federal Hall on Wall Street. Philadelphia became the next U.S. capital in 1790. 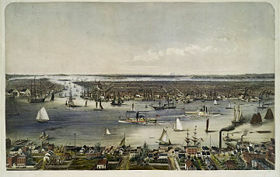 During the nineteenth century, the city was transformed by immigration, a visionary development proposal called the Commissioners' Plan of 1811, which expanded the city street grid to encompass all of Manhattan, and the opening of the Erie Canal, which connected the Atlantic port to the vast agricultural markets of the Midwestern United States and Canada in 1819. By 1835, New York City had surpassed Philadelphia as the largest city in the United States. Local politics became dominated by Tammany Hall, a Democratic Party political machine. Public-minded members of the old merchant aristocracy pressed for a Central Park, which was opened to a design competition in 1857—it was the first landscaped park in an American city. During the American Civil War (1861–1865), the city's strong commercial ties to the South, its growing immigrant population, and anger about conscription led to divided sympathy for both the Union and Confederacy, culminating in the Draft Riots of 1863, one of the worst events of civil unrest in American history. 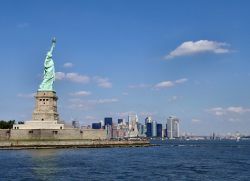 After the Civil War, the rate of immigration from Europe grew steeply, and New York became the first stop for millions seeking a new and better life in the United States, a role acknowledged by the dedication of the Statue of Liberty in 1886. In 1898, New York City took the political form in which it exists to this day. Manhattan and the Bronx, though still one county, were established as two separate boroughs and joined together with three other boroughs created from parts of adjacent counties to form the new municipal government originally called "Greater New York." The Borough of Brooklyn, incorporated the independent city of Brooklyn and several municipalities in eastern Kings County, New York; the Borough of Queens was created from western Queens County (with the remnant established as Nassau County in 1899); and The Borough of Staten Island contained all of Richmond County. All municipal (county, town, and city) governments contained within the boroughs were abolished. 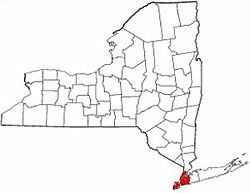 In 1914, the New York State Legislature created Bronx County, making five counties coterminous with the five boroughs. On June 15, 1904, over 1,000 people, mostly German immigrants, were killed when the steamship General Slocum caught fire and burned on North Brother Island, in the East River; and on March 25, 1911, the Triangle Shirtwaist Company fire in Greenwich Village took the lives of 145 female garment workers. These events would eventually lead to advancements in the city's fire department, building codes, and workplace regulations. Throughout the first half of the twentieth century, the city became a world center for industry, commerce, and communication. Interborough Rapid Transit (the first New York subway company) began operating in 1904, and the railroads operating out of Grand Central Terminal thrived. New York City became the most populous city in the world in 1925, overtaking London. Despite the effects of the Great Depression, the 1930s saw the building of some of the world's tallest skyscrapers, including numerous Art Deco masterpieces that are still part of the city's skyline today. Both before and after World War II, vast areas of the city were reshaped by the rise of the bridges, parks, and parkways of coordinator Robert Moses, the greatest proponent of automobile-centered modernist urbanism in America. A post-World War II economic and residential boom was associated with returning veterans and immigration from Europe, and huge tracts of new housing were constructed in eastern Queens. In 1951, the United Nations relocated from its first headquarters in Flushing Meadows Park, Queens, to the East Side of Manhattan. 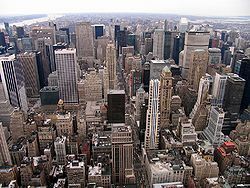 Like many U.S. cities, New York suffered population decline, an erosion of its industrial base, and race riots in the 1960s, and by the 1970s, the city had gained a reputation for being a crime-ridden relic of history. In 1975, the city government was on the brink of financial collapse and had to restructure its debt through the Municipal Assistance Corporation, headed by Felix Rohatyn. The city was also forced to accept increased scrutiny of its finances by an agency of New York State called the Financial Control Board. The 1980s saw a rebirth of Wall Street, and the city reclaimed its role at the center of the worldwide financial industry. Organized crime has been associated with New York City since the early twentieth century, when legendary mobsters roamed and controlled certain areas of the city and many businesses. In the 1980s, prosecutors like Rudolph Giuliani became famous for successfully prosecuting notorious crime bosses, restoring faith in the American justice system. In the 1990s, as crime rates dropped drastically and the outflow of population turned around, the city once again became the destination of immigrants and U.S. citizens seeking the lifestyle that only New York City could offer. Since 1991, New York City has seen a continuous trend of decreasing crime. New York City was the site of a terrorist attack on September 11, 2001, when nearly 3,000 people were killed by an al-Qaeda terrorist strike on the World Trade Center, including New Yorkers employed in the buildings, passengers and crew on two commercial jetliners, and hundreds of New York City firemen, policemen, and rescue workers who came to the aid of the disaster. Thick, acrid smoke continued to pour out of its ruins for months following the Twin Towers' fiery collapse. The city has since rebounded and the physical cleanup of Ground Zero was completed ahead of schedule. The Freedom Tower, intended to be exactly 1,776 feet tall (a number symbolic of the year the United States Declaration of Independence was written), is to be built on the site and is slated for construction between 2006 and 2010. New York City is governed by the New York City Charter. The charter is enacted and amended by the New York State Legislature, and occasionally through referendum. Though subservient to the state of New York, the city enjoys a high degree of legislative and executive autonomy. Like most governmental entities in the United States, the city government is divided into executive, legislative and judicial branches. In 1898, when New York City was consolidated into its present form, all previous town and county governments within it were abolished in favor of the present five boroughs and a unified, centralized city government. The executive branch of New York City is headed by the mayor, who is elected by direct popular vote. The mayor of New York City appoints several deputy mayors to head major offices within the executive branch of the city government. Deputy mayors report directly to the mayor. Legislative power in New York City is vested in a unicameral city council, which contains 51 members, each representing a district of approximately 157,000 people. Council members are elected every four years, and the leader of the majority party is called the speaker. Like most legislative bodies, the city council is divided into committees which have oversight of various functions of the city government. Unlike the rest of New York State, New York City does not have typical county courts. Instead, there is a single civil court, with a presence in each borough and city-wide jurisdiction, and a criminal court for each New York City county, which handles lesser criminal offenses and domestic violence cases, a responsibility shared with the family court. New York City is located in the middle of what is known as the BosWash megalopolis, 218 miles (350 km) driving distance from Boston and 232 miles (373 km) from Washington, D.C. The city is situated on the three major islands of Manhattan, Staten Island, and on western Long Island (Brooklyn and Queens), as well as on the mainland in the Bronx. There are also some smaller islands in the surrounding waters, including Ellis Island, Governors Island, Liberty Island, Roosevelt Island, and small islands located in Jamaica Bay. The Hudson River flows from the Hudson Valley into New York Bay, becoming a tidal estuary that separates the Bronx and Manhattan from New Jersey. The East River, really a tidal strait, stretches from the Long Island Sound to New York Bay, separating the Bronx and Manhattan from Long Island. The Harlem River, another tidal strait between the East and Hudson rivers, separates Manhattan from the Bronx. Upper New York Bay is surrounded by Manhattan, Brooklyn, Staten Island, and the coast of New Jersey, and is connected by the Narrows between Brooklyn and Staten Island to Lower New York Bay, which is partially surrounded by Brooklyn, Staten Island, and the coast of New Jersey, and opens to the Atlantic Ocean. New York City has a humid continental climate, though being adjacent to water it suffers less temperature fluctuation than inland areas. New York winters are typically cold (though not severely so; temperatures below 0°F (-18°C) only occur about once per decade on average). Temperatures in the 10s and 20s (°F) are quite common at the height of winter and New York winters sometimes feature snowstorms that can paralyze the city with over a foot (30 cm) of snow (such as the Blizzard of 1888, which led to the city's telephone and telegraph lines moving underground, and led to the building of the subway). Summers in New York are hot and humid, with temperatures commonly exceeding 90°F (32°C), although high temperatures above 100°F (38°C) are about as rare as subzero (°F) lows in winter. Humidity levels are usually quite high in July and August. Autumns are comfortable in New York and similar to spring in temperature. As of the census of 2010, there were 8,175,133 people residing in New York City. The city had a population density of 27,532 people per square mile (10,630/km²), rendering it the most densely populated of all municipalities housing over 100,000 residents in the United States. The racial makeup of the city in 2010 was 44 percent white (33.3 percent non-Hispanic white), 25.5 percent black (23 percent non-Hispanic black), 0.7 percent Native American and 12.7 percent Asian. Hispanics of any race represented 28.6 percent of the population,] while Asians constituted the fastest-growing segment of the city's population between 2000 and 2010. New York City alone, according to the 2010 Census, has now become home to more than one million Asian Americans, giving it the highest total Asian population of any U.S. city proper. Approximately 37 percent of the city's population is foreign-born. No single country or region of origin dominates. New York City has a high degree of income disparity. In 2005, the median household income in the wealthiest census tract was $188,697, while in the poorest it was $9,320. The religious affiliations of New York citizens are as follows (as of 2007): Protestant 40.0 percent, Roman Catholic 38.9 percent, Baptist 7.3 percent, Methodist 6.1 percent, Episcopalian 5.5 percent, Presbyterian 3.2 percent, Jewish 3.4 percent, Muslim 2.4 percent, and non-religious 17.9 percent. Protestants are mainly concentrated in and around New York City. In terms of race, almost 50 percent of blacks are Protestant; 35 percent of Protestants are white, 10 percent are Chinese, and 29 percent are Korean Americans. Catholics are mostly of Irish, French, Hispanic, and Italian descent, while many others are black and others are Asian. The Washington Heights neighborhood of Manhattan contains the shrine and burial place of Saint Frances Xavier Cabrini (Mother Cabrini), the patron saint of immigrants. Historically, the city developed because of New York Harbor, widely considered one of the finest natural ports in the world. The value of this port was greatly expanded in 1819 with the opening of the Erie Canal, which gave New York an enormous advantage over the competing ports of Boston and Philadelphia. The old port facility was at the South Street Seaport in Manhattan, but today there is still residual activity remaining at Red Hook in Brooklyn, and the Howland Hook Marine Terminal in Staten Island. Red Hook handles the majority of the cacao bean imports to the United States. Since the 1950s, most shipping activity in the area has shifted to the Port Newark-Elizabeth Marine Terminal in New Jersey. Despite changes in international shipping, trade and the tertiary sector of industry have always remained the real basis of New York's economy. Manufacturing first became a major economic base for New York City in the mid-nineteenth century with the advent of industrialization and the railroad. New York was formerly a national center for clothing manufacturing. There are still around 120,000 manufacturing jobs in the city compared to over a million in the middle of the twentieth century. Like international shipping, though, manufacturing gradually declined in the late-twentieth century with rising land values. The city was also a pioneering center for the American film industry. Today, New York City is the chief center of finance in the world economy, with Wall Street in Lower Manhattan's Financial District. 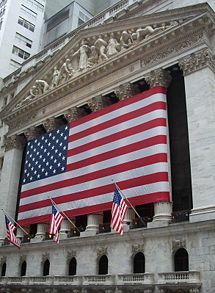 Financial markets based in the city include the New York Stock Exchange, NASDAQ, American Stock Exchange, New York Mercantile Exchange, and New York Board of Trade. Many corporations also have their headquarters in New York. New York is also the center of many service sector industries in the U.S., with more Fortune 500 companies headquartered in the city than anywhere else in the country. The city is an important center for American mass media, journalism, and publishing. Manhattan's Madison Avenue is synonymous with the American advertising industry, while Seventh Avenue is nicknamed "Fashion Avenue" as it serves as an important center for the fashion industry. Ninety percent of the diamonds imported to the United States pass through New York, and most of these are handled and cut in the city's Diamond District on 47th Street between Fifth and Sixth Avenues. New York is also an important center for art, music, and theater in the U.S. 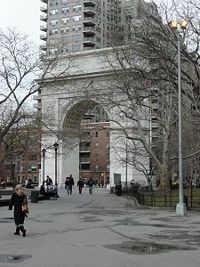 The Washington Square Arch in Greenwich Village, Manhattan. New York City, sometimes called "The City That Never Sleeps," is famously fast-paced and active, and the American idiom "in a New York minute" means "immediately." New York City residents are called "New Yorkers." Residents of the metropolitan area generally refer to New York City (or sometimes just Manhattan) as "The City," or "New York," and the acronym "NYC," as opposed to just "NY," helps to avoid confusing references tothe state of New York. The nickname most used for New York City is the "Big Apple." Because of traffic congestion and the well-designed New York Subway, six in ten residents, including many middle class professionals, commute to work via public transportation, making the everyday lifestyle and "pedestrian culture" of New Yorkers substantially different from the "car culture" that dominates most American cities. This pattern is strongest in Manhattan, where subway service is better and traffic is worse than in the outer boroughs. Jackson Heights, Queens, is among the world's most diverse communities. Regardless of ethnic origin, all groups share a common identity as New Yorkers. New York absorbs a greater diversity of immigrant groups than any other American city, and it absorbs a larger number of immigrants every day than all other U.S. cities except Los Angeles. Its international flavor makes it the archetype of the American ideal of a melting pot—a nation of blended cultures. The city government employs translators in 180 languages. 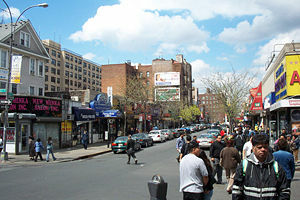 Some celebrated ethnic/racial neighborhoods include Harlem, Little Italy, Flushing, Jackson Heights, Chinatown, Washington Heights, Briarwood, and the Lower East Side. The Lower East Side and The East Village are where the term "melting pot" originated—referring to the droves of people from diverse European nations squeezing into this small, 100-block or so area of tenements, learning to live together for the first time. The Statue of Liberty in Upper New York Bay has welcomed many immigrants to the city. Tourism is a major local industry, with hundreds of attractions and an average of 39 million tourists visiting the city each year. 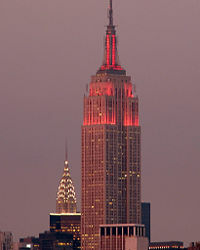 Many visitors make it a point to visit the Empire State Building, Times Square, Radio City Music Hall, the Statue of Liberty, Ellis Island, Wall Street, United Nations Headquarters, the American Museum of Natural History, St. Patrick's Cathedral, and the Brooklyn Bridge, among other attractions. There are over 28,000 acres (113 km²) of parkland found throughout New York City, comprising over 1,700 separate parks and playgrounds. The best known of these is Central Park, which is a great example of landscape architecture, as well as a major source of recreation for New Yorkers and tourists alike. The city also has 578 miles (930 km) of waterfront and over 14 miles (22 km) of public beaches. 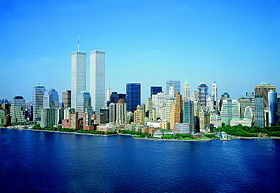 The World Trade Center  was an important tourist destination before the September 11, 2001 attacks, which devastated the city and its tourist industry. The city was nearly devoid of tourists for months, and it took two years for the numbers to fully rebound with fewer international, but more domestic visitors. Now, the World Trade Center site has itself become an important place for visitors to see. New York is a city of great museums with the Metropolitan Museum of Art's assemblage of historic art, the Museum of Modern Art and Guggenheim Museum's twentieth-century collections, and the American Museum of Natural History and its Hayden Planetarium focusing on the sciences. A number of the city's museums are located along the Museum Mile section of Fifth Avenue. In addition to these museums, the city is also home to a vast array of spaces for opera, symphony, and dance performances. The largest of these is Lincoln Center for the Performing Arts, which is actually a complex of buildings housing 12 separate companies, including the New York Philharmonic, the Metropolitan Opera, the New York City Opera, the New York City Ballet, and Jazz at Lincoln Center. Other notable performance halls include Carnegie Hall, Radio City Music Hall, and the Brooklyn Academy of Music. New York City has been the subject of many different, often contradictory, portrayals in mass media. Because of its sheer size and cultural influence, New York has served as the unwitting backdrop for virtually every conceivable viewpoint on big city life. New York’s portrayal on television is similarly varied, with a disproportionate number of crime dramas taking place in the city despite the fact that it is one of the safest cities in which to live in the United States. New York City boasts over 40 daily newspapers in several different languages, including such national heavyweights as the Wall Street Journal (daily circulation of 2.1 million) and the New York Times (1.6 million), and America's oldest continuously-published newspaper, the New York Post, founded in 1801 by Alexander Hamilton. New York City also is the home and broadcasting capital for the four major U.S. television networks, ABC, CBS, NBC, and the Fox Network, as well as the news network CNN. The New York City film industry is second in revenue only to that of Hollywood. With its connection to media and communications and its mix of cultures and immigrants, New York City has had a long history of association with American music. The city has served as an important center for many different genres of music ranging from the Big Band Era and jazz, from punk rock to goth and hip-hop (the latter of which is generally acknowledged as having originated in the Bronx around 1973). The East Village and Lower East Side continue to shine as the city's premier destination for music (rock, blues, jazz, dance), art (mixed media), and indie theater (experimental, off-Broadway). From CBGB's to LaMama Theater to the Amato Opera House, the area is famous for having a "venue on every block." 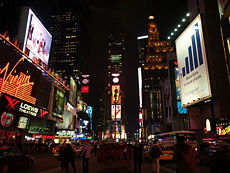 New York City boasts a highly active and influential theater district, which is centered on Times Square in Manhattan. It serves both as the center of the American theater industry, and as a major attraction for visitors from around the world. Along with London’s West End theater district, Broadway theaters are considered to be of the highest quality in the world. Despite the name, many "Broadway" theaters are not located on Broadway Street and the distinction with off-Broadway and off-off-Broadway (which tends to mean experimental theater) is simply a reference to the seating capacity of the theater. 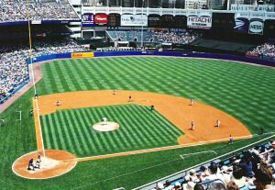 Although football has become the most popular American professional sport, in New York City baseball arguably still stirs the most passion and interest. A "Subway Series" between the city teams is a time of great excitement, and any World Series championship by either the New York Yankees or the New York Mets is considered to be worthy of the highest celebration, including a ticker-tape parade for the victorious team. The New York metropolitan area is the only one in the United States with more than one team in each of the four major sports (football, baseball, basketball, and ice hockey), with nine such franchises. New York City was the host of the 1998 Goodwill Games. 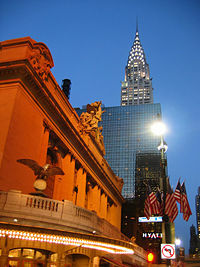 Grand Central Terminal (and Chrysler Building) along 42nd Street. Unlike most of America's car-oriented urban areas, public transportation is the most common mode of travel for the majority of New York City residents. As of 2001, 50 percent of New York City households and only 20 percent of Manhattan households had access to a vehicle, as compared to more than 90 percent nationwide. The city is served by an extensive network of parkways and expressways. New York City boasts the most extensive network of public transportation in the United States. The world-famous New York City Subway is operated by the Metropolitan Transportation Authority (MTA). It is the most extensive subway system in the world when measured by mileage of track (656 miles of mainline track), and the fifth largest when measured by annual ridership (1.4 billion passenger trips in 2004). The subway system connects all boroughs except Staten Island, which is served by the Staten Island Railway via the free Staten Island Ferry (which connects to the one subway line). The city is also served by the Port Authority of New York and New Jersey's Port Authority Trans-Hudson (PATH) subway system, which connects the borough of Manhattan to New Jersey. 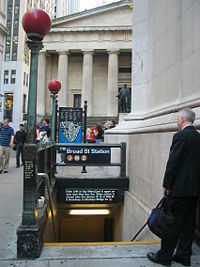 A typical subway entrance in the Lower Manhattan financial district. The Port Authority also owns and operates the four major airports in the New York City area, John F. Kennedy International Airport (JFK) in Jamaica (Queens), Newark Liberty International Airport in Newark, New Jersey, La Guardia Airport in Flushing, New York, and Teterboro Airport in Teterboro, New Jersey. New York City is served by the publicly-run City University of New York (CUNY), the largest urban university in the United States, which has a number of campuses throughout the five boroughs. The city is also home to other institutions of higher learning, some of national or even international reputation, including Columbia University, Fordham University, Manhattan College, New York University, the Juilliard School, The Cooper Union, Marymount Manhattan College, and The New School. New York City is also a major center of academic medicine. Manhattan contains the campuses of the world-class Rockefeller University, Weill Cornell Medical College, and Memorial Sloan-Kettering Cancer Center, as well as Columbia-Presbyterian Medical Center and NYU Medical Center and their medical schools. In the Bronx, the Albert Einstein College of Medicine of Yeshiva University is a major academic center. Brooklyn also hosts one of the country's leading urban medical centers: SUNY Downstate Medical Center, an academic medical center, the oldest hospital-based medical school in the United States. Professor Raymond Vahan Damadian, the inventor of the MRI, was part of the faculty from 1967 to 1977 and built the first MRI machine there. New York City is also home to several of the nation's top schools of art and design, including Pratt Institute, the School of Visual Arts, the Fashion Institute of Technology, and Parsons School of Design. New York City has one of the most famous skylines in the world; because of both its high residential density and the extremely high real estate values found in the city's central business districts, New York has amassed the largest collection of office and residential towers in the world. In fact, New York actually has three separately recognizable skylines: Midtown Manhattan, Downtown Manhattan (also known as Lower Manhattan), and Downtown Brooklyn. New York City has a long history of tall buildings and the downing of the World Trade Towers by terrorists in 2001 was a tragedy unparalleled in American civil history. ↑ Why is New York City known as "the Big Apple" and "Gotham?". Dictionary.com, LLC. Retrieved January 17, 2018. ↑ Eugene J. Sherman. FORWARD New York – Capital of the Modern World. The Weissman Center for International Business Baruch College/CUNY 2011. Retrieved January 17, 2018. ↑ Sam Roberts (April 5, 2012). 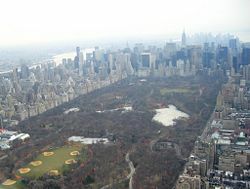 Population Growth in New York City Is Outpacing 2010 Census, 2011 Estimates Show. © 2012 The New York Times Company. Retrieved January 17, 2018. ↑ World Trade Center. The Official Website for New York City Tourism. Retrieved January 17, 2018. ↑ Project Rebirth. Retrieved January 17, 2018. NYC.gov – official website for the city. History of "New York City"
This page was last modified on 20 November 2018, at 16:16.